Two of New Zealand's finest songwriters together on stage for an evening of yarns, ballads and barnstormers. 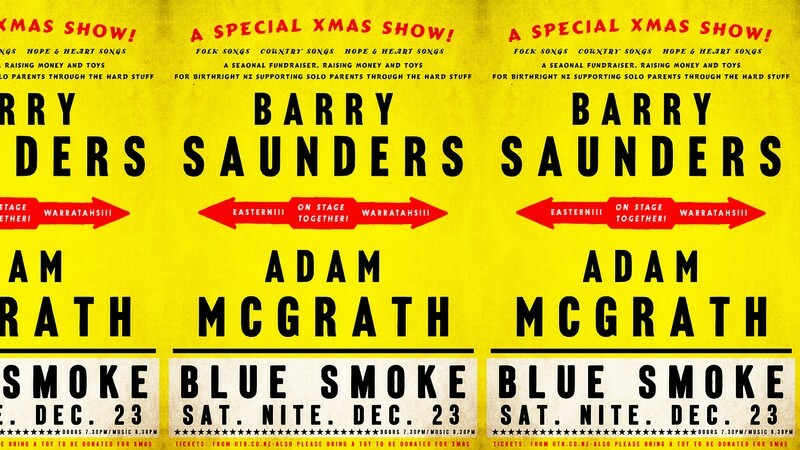 Barry Saunders of The Warratahs and Adam McGrath of The Eastern are both known for the rolling, rambling, spirit raising atmospheres they project in their respective live shows. So it seems only fitting that Saunders and McGrath will be coming together this December for an evening of good old fashioned folk singing and Christmas hope building; bring along a children's toy or gift to donate to Birthright Christchurch (a not for profit organization that provides support to solo parents). All gifts big or small will be gratefully accepted and much appreciated. And Saunders himself is truly a New Zealand icon, with a career that has spanned thirty years.